Hello there. 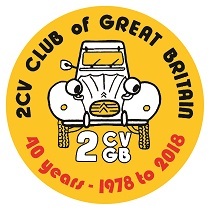 I am Paul Brice and I'm the 2cvGB club Méhari Registrar. I'm a self employed architect and have a long-suffering partner, Kate. We have two, teenage children; Sarah and Tom. We live in Monmouth, South East Wales. I had a Dyane for a couple of years when I was working in London in the 1980's. After a long break, I was reintroduced to the joy's of 'A' Series Citroen ownership when a good friend found 'Harvey', my 1982 Dyan 6. I bought him and joined 2cvGB in July 2010. Since then, I have acquired 'Xavier', a late 1969 Dyane 4 Luxe, from France, 'Rufus', my 1974, Ex-French Army Méhari and my 1983, RHD conversion Acadiane. I enjoy cleaning, repainting, oiling, greasing and generally fettling and improving each of my cars. I enjoy the simplicity and clarity of engineering of 'A' Series Citroens. As I have needed to spend much more time on 'Rufus' than my other cars, I have developed a very close relationship with him. 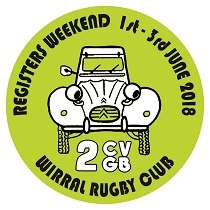 I have had the privilege of winning the 2cvGB Méhari Register with 'Rufus' and I was happy to take up the reins of the Méhari Register this summer from my excellent predecessor, Colin Jenkins. The Citroen Méhari was produced by Citroen as a utility vehicle, aimed initially for use by the French army, and later as a practical and fun car. A total of 144,953 Méharis were built between 1968 and 1988. Good and accurate details of the car and its history can be found on the internet. The aim of the 2cvGB Club Méhari Register is to record and offer help and advice to club-member owners of Méharis in the UK and elsewhere. There are about 30 active Méharists registered and on the road in the UK, but over 100 Méharis have passed through the club over the years. There are considerable more Méharis on the roads and hidden in barns in France, especially around sunny coastal resorts. 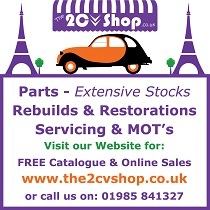 Being based on the 2cv/Dyane running gear and engine, the car is easy to look after. With chassis, space-frame and body components still being produced by specialist suppliers in France, it is possible to restore a Méhari to 'as new' condition. Méharis are great fun to drive and they offer the pleasures of open-top touring in warm weather. My Méhari is my summer car of choice. People smile when you pass by. Get one, join 2cvGB and see for yourself. You'll never be alone in a supermarket car park again. Please get in touch with me and tell me about your Méharis. Send photos or articles for me to add to my monthly 'Méhari Missive' in the magazine, or just email or call if you have any questions about buying or owning a Méhari.